I seem have a very strong recall for the name Jim Corbett. Probably parts of his book was used during my schooling days? Not too sure, but when my wife brought up the topic of visiting this place, I immediately agreed. The initial write-up is taken from another site where I had posted reviews on 30-May-2014. I’ll come back to this post to update it with further info and pics and improve the narrative. Let me tell you – it is very very difficult to spot a tiger. 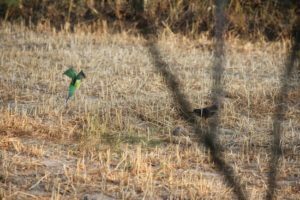 You may need to spend a 2-3 days consciously looking for them on your safaris and walks. 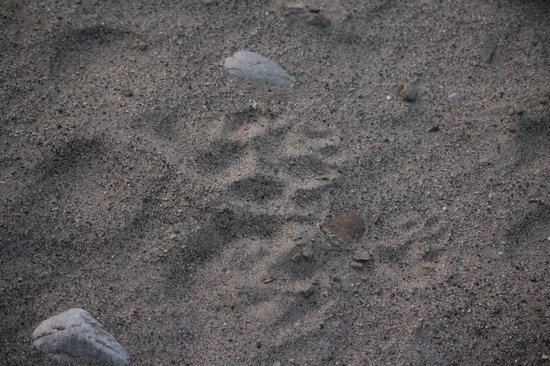 Paw prints are guaranteed – some may even be fresh. Most other animals – deer, monkeys, peacock, and a variety of birds are a definite sight. 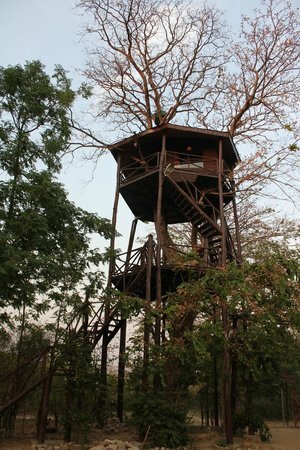 Stay options and safaris are varied – hence do your research. Garjiya Devi mandir is a must – you can also do the Museum along with it. Stayed here with family including young children. First of all, this place is in Dhela which is around 15 km from Ramnagar, but seems to be tagged at incorrectly in Google Maps. The good part is that the drive to this place is quite scenic through some rural life and some forest areas. However, I wouldn’t really recommend it for family. The cottages are somewhat dingy from the inside – we eventually shifted to a slightly better one, but it still didn’t meet my expectations. They have no intercom; only two mobile networks (Idea and one more) that work in the area; no hospital or doctor nearby, no shops (basically not much habitation) within walking distance. But the staff was very helpful – they even loaned us a SIM card (we paid for the recharge). Food was tasty but oily / spicy – not easy for kids. Swimming pool was Ok, but not clean enough. No group activity in the evenings. But the best part for us was their guided nature walk – this is a 90 minute walk right from the resort to cross over a dried up river bed onto some thicker forest area. We saw several deer crossing and probably came really close to a tiger – though we didn’t see it, we saw a bustle in the bushes.and later heard a deer scream out when it was possibly caught. The experience was exciting and humbling. If you like photography, an early morning walk could turn out to be interesting – there are a lot of birds around. This place could be much better if it was either closer to city or had enough things to do within the resort. 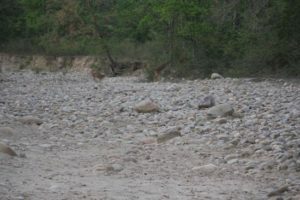 We waded through the water near Garjiya Devi Temple. It was nice even for the kids. There may be other good spots too, but didn’t explore much. The Kosi barrage near Ramnagar is a good sight seeing spot with a lot of migratory birds. An enjoyable cross over a bridge on Kosi river takes you to the shops near the temple. And then there is a nice climb to the top – Garjiya devi is worth the darshan, and the view from top is fabulous. You can get into the Kosi river close to the temple. The Corbett museum is not too far from here – you can see huge stuffed tigers that died of various reasons. 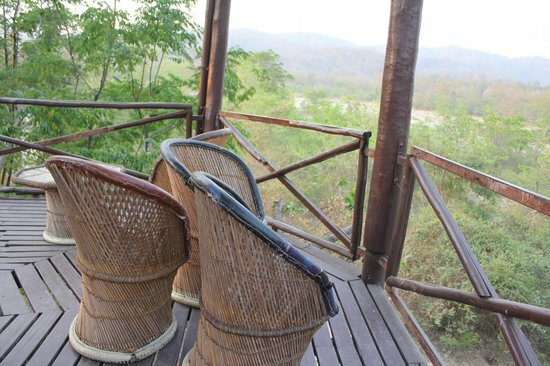 Corbett Machaan Resort: Jungle feel within short distance. Good service. Stayed here with family including young children. Our drive in from Delhi took longer than we thought – thanks to really bad roads near Kashipur. GPS got us close to the resort, but the last 1/2 km is confusing – so make sure you reach at a time when you might find people. It is a small place, but quite nice. Cottages are dimly lit, but homely with a rural feel. If you look closely, you might find the furniture dusty. We had a couple of light bulbs to be replaced, and requested for an early dinner since we were tired. Bulbs were replaced quickly and dinner was served in our room! Dinner was really really good! – one of the best I’ve had. They had a song and guitar night – that was very soothing. But mosquitoes around so take your own repellent. Their restaurant area is filled with loose gravel and the kids got their shoes dirty. Swimming pool was Ok, not very clean and we didn’t try it though we saw others using it. Our package included all 3 meals – overall, very much worth it and I wouldn’t mind going again.